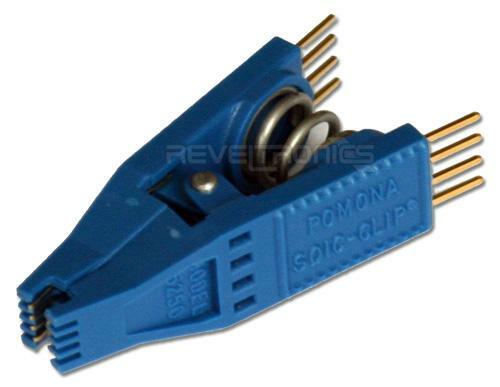 Test clip for SOIC-8 chips from POMONA. It's compatible with 150mil and 200mil cases. It can be used for ICSP (in-circuit serial programming). SOIC-8 Test Clip compatible with SMD 8-pin chips (SO-8 150mil and 200mil cases). Clip is oryginal produced by POMONA (high quality). 8 output "gold-pins" type in 2,54mm raster. In Circuit Serial Programming (ICSP) for firmware upgrade in motherboards (BIOS), instrument clusters, immobilisers etc. compatible with all programmers (output 2,54mm goldpins), e.g. with REVELPROG-IS. goten2 · 2 years ago. luki00769 · 3 years ago. Transakcja przebiegła pomyślnie. Polecam. Towar godny polecenia. Kontakt idealny. Polecam!!! !